One of the changes that Microsoft introduced in the company's Windows 10 operating system affected the appearance of scroll bars on the system. The default behavior hides scroll bars automatically in Windows. While that feature is limited to (mostly) Windows Store applications and not desktop apps, it affects all users as native apps like Settings use the system as well. Microsoft uses the term hiding and that is correct as the scroll bar is hidden automatically when a window becomes inactive. Activation, e.g. clicking on the window to make it the foreground window, does not display the full scroll bar but a smaller one. Only when you interact with the scroll bar is the full scroll bar displayed. While some users may find the feature useful, as it may display more information in a program window thanks to the extra bits of width for content, others may dislike it because it may be more difficult to interact with the scroll bar. You need to move the mouse over the scroll bar area and wait for a moment to expand it from thin to full, and when you move the mouse away it goes back to the thin version automatically. Find the "Automatically hide scroll bars in Windows" preference and set it to off. You should notice that scroll bars return to the big state automatically and that Windows 10 does not hide them anymore on the system once you have made the change in the Settings application. You can restore the status quo at any time by setting the preference to on again in the Settings application. The new visual tweak to hide scroll bars on Windows 10 gives applications a bit of extra space for content. While that is always appreciated, having to wait a short moment before the full scroll bar is displayed may not be appealing to some users of the operating system. Those can disable the functionality to restore full scroll bars across the system. Some users may not come across hidden scroll bars that much as it depends on whether they use Store apps or native apps regularly. Now You: What is your take on hiding scroll bars? 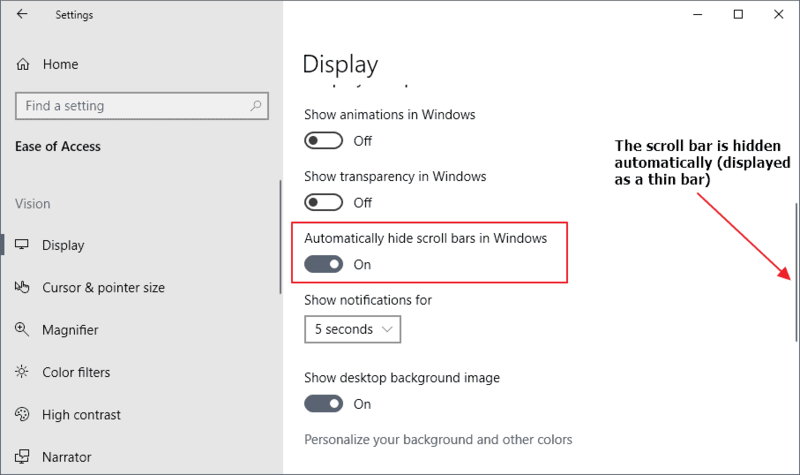 Find out how to disable the scroll bar hiding of the Windows 10 operating system so that scroll bars are displayed in full all the time. Jojo which version of Windows 10 do you use? Is this feature available for Home edition? I’m running Windows 10 Home 1709 on my laptop. In my Ease of Access settings, there’s no Display option. I only checked in 1803, maybe Microsoft introduced the feature in that version? Can anyone confirm? The scroll bar setting is on my machine: Win Pro x64 1803 Build 17134.165. I like the fat scroll bar. Thanks for the tip. It’s there on 1709 too, at least on the Enterprise ISO. I can’t edit my message so I’ll post as a reply. It might be in a different location, so use search, but I’m sure it’s there. There is no such option on 1709 Enterprise, I guess this may become enabled if user is using assistive technologies. Not there for me. Search doesn’t find it either. Does anyone know the registry key for this. This setting is not on Windows 10 1709(build: 16299.431) Enterprise. All right. Win 10 Pro x64. I just this morning updated from 1709 to 1803 Build 17134.167. The scroll bar setting is indeed in Ease of Access. Turned the slider off and the scroll bars magically appeared. It is found under ease of access-display; not system-display. Thank you! I hate all of this phone-ization, more swipes needed for everything. I’m right there with you. A phone’s UI is a compromise with limited real estate and having to be a touch interface. That means that the UI sacrifices useful things in order to work better on phones. Bringing that interface outside of the restricted environment it was designed for simply means that you’re using a UI that’s sacrificing useful things for no reason whatsoever. I absolutely don’t want scroll bars hidden under any circumstances. Thanks for letting us know that this can be disabled! I seldomly click on scrollbars, so I generally appreciate them being small, but what I really can’t stand, is when you have your mouse near the scrollbar, trying to click on something there, and then the scrollbar jumps in between, making you scroll to some random place. Not available on Windows 10 Pro, 1709. Must have been added to the latest version (1803?) but I am on the semi-annual NOT the “targeted” and I have updates paused too, so I’m not on the latest version yet. The regkey is not working. The scroll bars still hide. I have Win 10 Pro 64-bit Build 1803 and there are few options at all on the Display settings. Certainly NOT any of the ones your screen pic shows. I chose Win 10 because it was supported to 2024 (Win 7 to 2020) and now wish I’d gone with 7, letting it hang around like XP has with 3rd party AV and firewall (yes I still have a couple old XP PC’s because of special hardware I still use). In total, Win 10 looked good for a few days, then got uglier as the beer wore off. Not as stable, constantly updating, wishing most of it wasn’t trying to be cool with the touch screen set. The touch screen folks should have their own OS. I want a Win7 makes 11 solution for the next “NEW” Windows I use. Which version of Windows 10 do you run? It is in Windows 10 version 1809 definitely, the latest version.